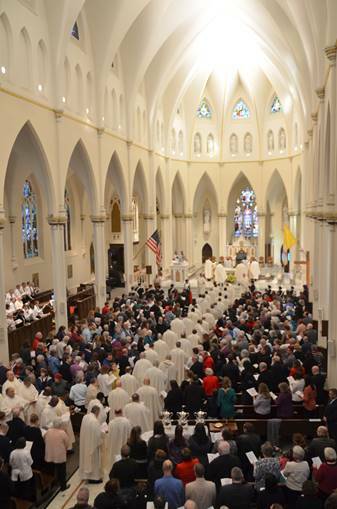 Hundreds of worshippers gathered Tuesday night at Portland’s Cathedral of the Immaculate Conception for Chrism Mass and to pray for the people of Paris grieving over the fire that heavily damaged their beloved Notre Dame Cathedral Monday. Bishop Robert P. Deeley asked those in attendance to pray for the people of Paris, according to a statement from the diocese. He reminded those in attendance of the many challenges that the Cathedral of the Immaculate Conception has faced since it was dedicated 150 years ago. The Congress Street church, an imposing Gothic Revival structure, is listed on the National Register of Historic Places. “It is remarkable, however, to see the work the Lord accomplishes through us, and the grace which abounds in our church,” Deeley said. Deeley concluded his homily with a special message of unity to those suffering in Paris and around the world after Monday’s tragic fire. Dave Guthro, spokesman for the Roman Catholic Diocese of Portland, said every pew in the church was filled to capacity Tuesday evening and estimated the crowd at 900 people. About 100 priests and deacons attended as well. Chrism Mass is one of the most significant and solemn liturgies of the Catholic Church. The bishop blesses three oils – the oil of catechumens, the oil of the infirm and holy chrism – which will be used in the administration of the sacraments throughout the diocese for the year.